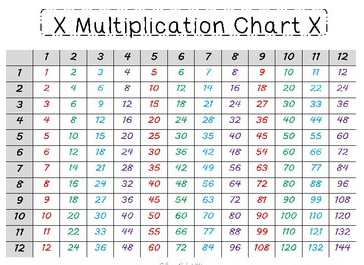 Teaching your students multiplication? Need a quick reference guide to fill out and use? This multiplication packet includes an easy to follow color coded chart, a completed chart with tracing font, and a blank chart. This package is perfect for students who need a little more help to fill out a chart or those just beginning to practice filling out a multiplication chart. Check out Multiplication Homework Worksheets or Multiplication Homework Worksheets with Tracing for multiplication activities. These activities are designed to teach multiplication facts while practicing the concept of multiplication, reviewing prerequisite skills such as addition, and connect to related math concepts such as place value. I hope you enjoy these charts in your classroom! Please leave feedback to earn TPT credits and follow my store for more great products! Thank you!